10 Jazz Etudes: Based on the Harmonies of Famous Jazz Standards! This imaginative offering from Swedish trombonist, Anders Larson, may be utilized by musicians who play any of the bass clef instruments, and invites players possessing different levels of technique and musicianship into the world of jazz. 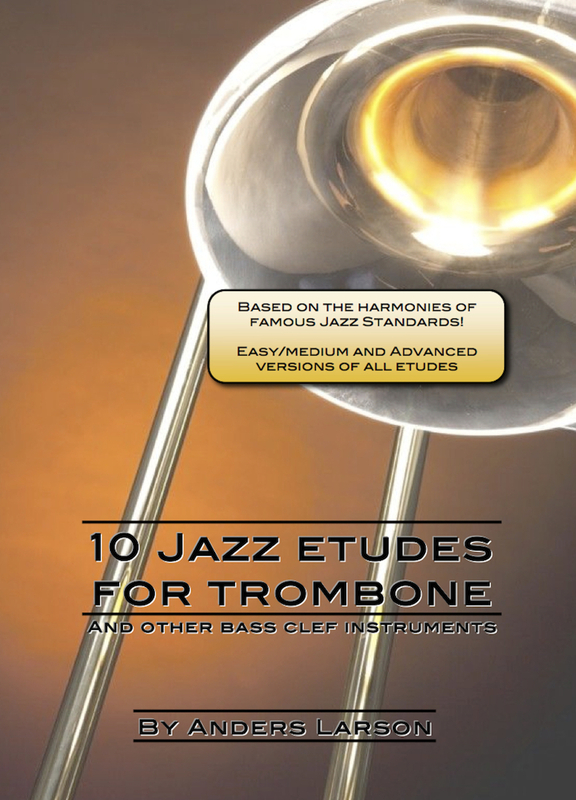 The title, 10 Jazz Etudes for Trombone, is misleading in a good way because the method includes multiple choruses in each etude including easy/medium and advanced choruses. Nine of the ten etudes are based on famous jazz standards, and one is an original tune composed by Mr. Larson. There is no accompaniment CD, but accompaniment tracks to all nine of the standards can be found easily online, and the original tune, Third Dilemma, can be found on Mr. Larson’s quartet album, Unborn. The etudes include composed solos on multiple choruses. The easy/medium-level choruses may be used to teach different styles of jazz playing for young classical players. They might also serve well as sight-reading exercises for the studio or for auditions or as a light warm-up for professional players. The advanced etudes are thoughtfully composed melodies that reflect Mr. Larson’s strengths as a trombonist and an improviser. They are artfully composed, useful in a study of improvisation. The blues and rhythm changes etudes include optional, lower, duet parts. Mr. Larson discusses the chord structures of these important forms and briefly discusses theory as it relates to his approach to improvising over the blues and rhythm changes. Larson includes a thoughtful vignette on performing ballads as well. There are minor issues with grammar, spelling, and sentence structure, hardly worth mentioning, but they might create some confusion, particularly in the section on rhythm changes. Subsequent editions might address this. Mr. Larson’s Facebook site, DigitalTrombone, is a good place to look for more resources. Generally speaking, this book is fun, and useful. All of the etudes may be used as sight-reading exercises for trombonists with disparate levels of playing ability. The standards are some of the most famous tunes a young jazz musician has to know and Mr. Larson’s strengths as a jazz musician and trombonist are reflected in his compositions, as well as his prose. This method will be useful for trombone teachers, improvisation teachers, and jazz ensemble directors at the high school level, the collegiate level, and beyond.